Want your product to stand out on shelves? Pouchjackets are the answer. These cost-effective, FDA compliant plastic pouches are printed with impressive 10-color, high resolution graphics to enhance product value and consumer appeal. Made with laminated barrier film structures that protect the contents and allow for long shelf -life, they are available in a variety of styles and custom sizes and can be printed with matte and metallic ink colors. Pouchjackets are ideal for food items, pet treats, coffee, tea, pharmaceuticals, cosmetics, agrochemicals, grass and bird seeds, and many other applications. Pouchjackets eliminate the need for cans, bottles, jugs and bulky containers. Pouches often hold more product with less packaging material and take less landfill space than rigid containers. 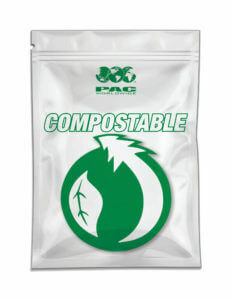 Recyclable and Compostable Pouches also available. Pouchjackets offer a variety of convenient packaging features such as tear notches, die-cut handles and hang holes. They are available with resealable zipper, slider closures, velcro closures, tin-tie closures, or add de-gassing or coffee valves. Spouts and other fitments offer spill control and tamper evidence. 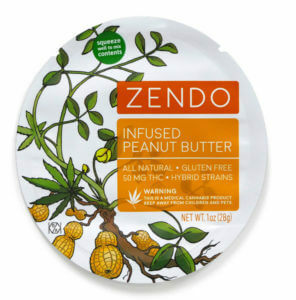 Made from FDA compliant food-grade materials, BPA free, ISO, HAACP and BRC certified and 3rd party quality tested for food contact materials. 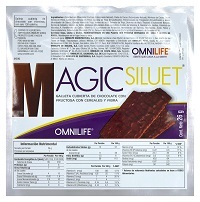 Special barrier films protect the product from spoilage. Our Quality Management System and Traceability Programs include quality lab testing, shipment inspections, quality claims, and technical data reporting on every order. PAC works with you to scale-up for new product launches or market testing and contract manufacturing innovations. This includes stages from digital mock-ups, prototypes, samples or sales mockups, and short runs. High impact, high resolution graphics and creative shapes and constructions add product value, which helps differentiate your brand from the competition. Available in matte or gloss finishes in matte or metallic ink. 10 color printing with flexographic or rotogravure. Newly added digital printing with high-resolution and pantone color matching available for quick turnaround (3 weeks average lead time) and unlimited graphic revisions or SKU’s, no plates or cylinders needed! 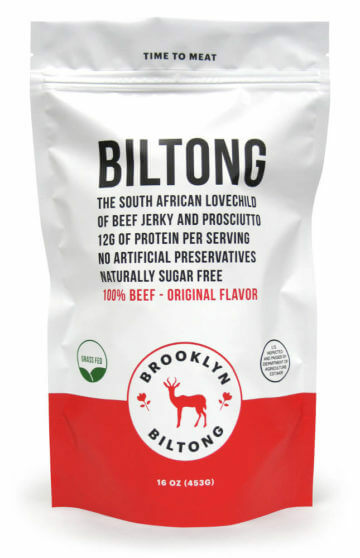 A bottom gusset and rigid front and back edges allow this package to stand up and be displayed on store shelves. 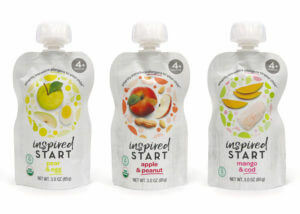 With impressive, high resolution graphics, our stand up pouches are a cost-effective flexible package alternative to rigid bottles, cartons, cans and jars. Retort pouches are used for pre-cooked processed food applications that involve high temperature sterilization and require a long shelf-life at room temperature. Retort pouches are the perfect alternative to cans or jars for canned foods to offer more convenience features for consumers, cost savings in packaging, and stand out on the shelf. Also available in spouted or with microwavable features. 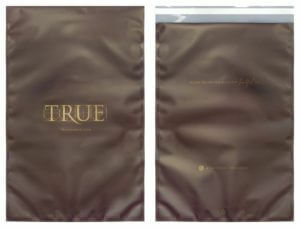 Three-side seal or center-seal pillow style pouches are produced with the opening at the top or bottom. 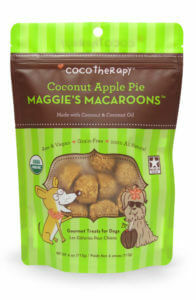 A tear notch is often incorporated into this type of pouch to allow for an easy opening. Microwavable pouches are heat resistant laminations offering consumer convenience to heat in the microwave. Also available: steam technology, self-venting, boiling bags, and spouted. “Cool touch” seals available for consumer safe removal from the microwave. BPA Free. 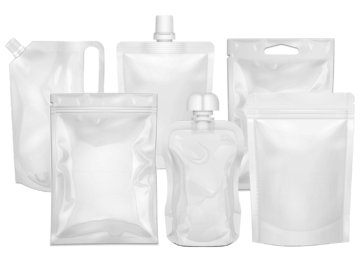 Spouted pouches provide extra convenience, spill control and food safety for many applications (i.e. liquid, semi-liquid, granular and powder products). Spouted pouches are safe, easy to use and lightweight. Available in many shapes and sizes with various features. These include choke-free caps, tamper evident closures, and narrow to wide mouth spouts. From small single-serve with top centered spouts to large refills with corner spouts. Also available in retort or microwavable. 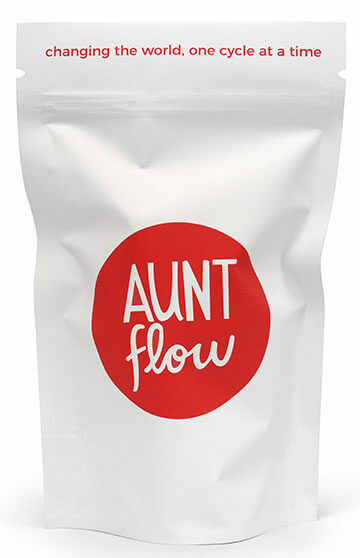 In addition to impressive printed graphics, you can add a creative element to your flexible packaging branding strategy with fun, functional and eye-catching shaped pouches. Our quad seal pouches are produced with side gussets for expanded capacity and optional bottom gussets for balanced box-like presentation. 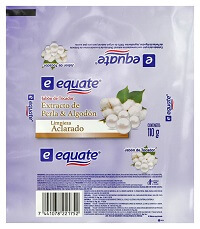 This quad seal pouch provides an ideal advertising billboard for your product in any shelf position. Custom rollstock is for customers with vertical and horizontal form-fill-seal (VFFS and HFFS) packaging machines.We offer up to nine gloss, matte and metallic ink colors printed on state-of-the art rotogravure and offset printing presses that will deliver even the most complex and demanding graphic designs. We offer multiple layers of lamination or coextruded films for product and machine specific requirements, to make many types of bags, pouches, flow wraps, and sachets. Custom film trials and technical support available. 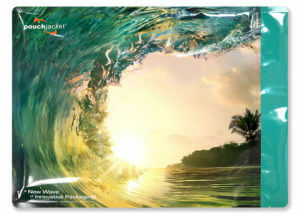 Advantages in laminated films for better aesthetics, feel, and overall consumer experience when they receive it in the mail. Features can include a premium matte film, glossy surface, a combination of matte & glossy, metallic inks, zipper closures, peel & seal, dual peel & seal with perforations, die cut handles, and full 10 color reverse printed graphics that won’t scratch or fade in transit. Protectjacket protects contents from the elements in shipping & handling because it is cushioned, completely sealed, and blocks odor, light, and moisture. The package protects children and parents from unintended access with it’s child-deterrent design and reclosable zipper, yet discreet for couriers. It is ideal for high-value contents shipped in a mailer requiring that extra protection inside and outside. 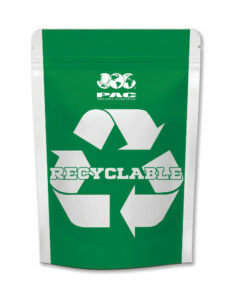 Introducing recycle ready pouches that can be returned for recycling! 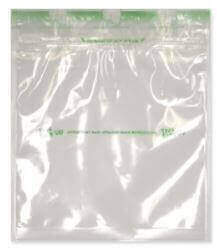 Most pouches made with multi-layer film structures that do not fit into existing PE film recycle streams. 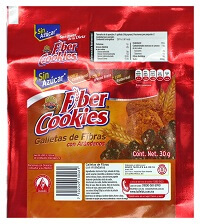 Flexible packaging in general, such as pouches, are not curbside friendly packages. 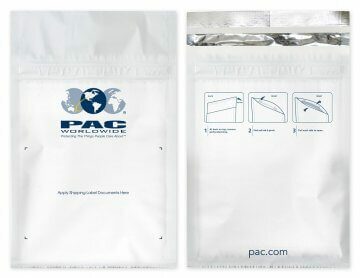 PAC’s recyclable pouches have been verified to be included in the How2Recycle program, where you can simply take your clean and dry pouches into participating retailers with Grocery Store Drop-Off programs. 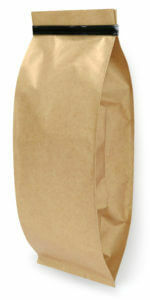 Introducing biodegradable or compostable pouches for eco-friendly packaging. BPI-certified pouches available.